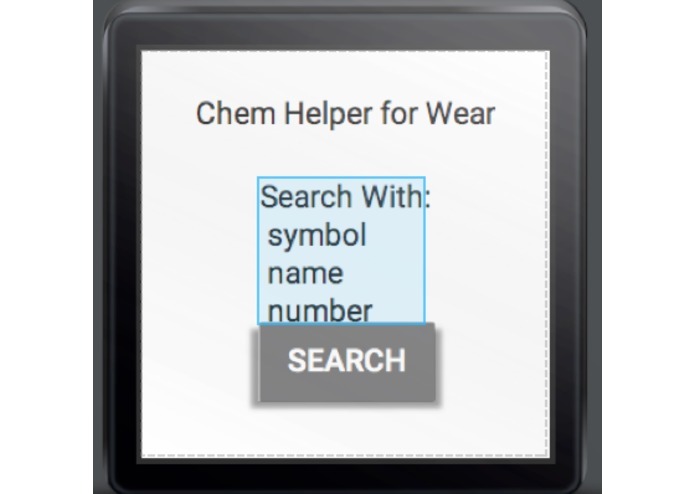 Search for an element by name, symbol, or number, and get info about that element, all from your wrist. I was at a Chem Class over the summer, and we were doing some problems with the properties of elements. I slowly came to realize how tedious a lot of this work was, scanning an index of fine print for Oxygen's melting point. I realized that all of this could be put into a simple app for easy use, and that's when I thought of putting it in a watch app. If I were to release the app, I hope it will help high school chemistry students with their problems. I'm particularly proud of the fact that you only have to tap a button and speak to get the info you are looking for. Due to the small screens on the watches, voice is a must have, as typing is extremely hard.